THIS WEEK, the British Computer Society launched its new identity, as part of what it calls the ‘transformation’ programme. In fact it now wants to be called only ‘the BCS’, along the lines of BAA and HSBC. But I predict that those of us who have been BCS members for some time will find it hard to drop the habitual mention of British, or Computer, or for that matter Society (BCS now wants to be called a ‘Chartered Institute’ instead). On Wednesday, 23 September, the BCS held a Member Groups Convention at the Royal Society’s building in Carlton Terrace. The BCS is home to scores of local branches, some International Sections, plus more than fifty Specialist Groups. The ‘SGs’ are volunteer-run societies, embedded within the BCS, which cater to special interests such as Fortran, computer history and conservation, project management, health informatics, security, interaction design, information retrieval, artificial intelligence… the list is a long one. In addition, there is a very active Young Professionals Group. The activities of the member groups form a vital part of the life of the BCS, and the Convention was held so that the elected and employed officers of the Society, I mean the Institute, could tell a collection of the organisers and activists from those member groups about the BCS’s new orientation and aspirations for the future. It also gave an opportunity for those of us who work as volunteers within the BCS member groups to think about how we can contribute to these goals. 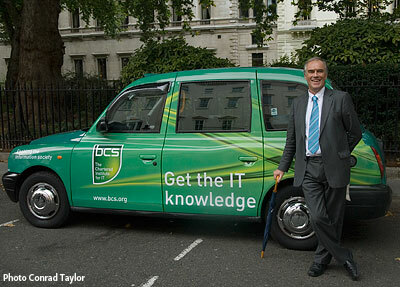 Adrian Walmsley, BCS vice-president for member services, stands beside one of the two London cabs sporting BCS marketing messages. The new visual identity of the BCS is a strong green colour, suffused with yellow glowing bits, and a half-shield logo device — as illustrated on one of two taxis currently carrying the BCS’s advertising messages on the streets of London. (Appropriately, the taxi shown has WiFi inside and a satellite data uplink!). There is also a new slogan to accompany the logo — Enabling the information society — and it is this new mission statement that I want to comment on here. As Alan Turing predicted, the conversion of data and information into numbers allowed glorified electronic adding machines to evolve into general-purpose information appliances. The Lyons catering company took a revolutionary step when it commissioned the creators of the EDSAC machine at Cambridge University to design a general-purpose business computer, which made its début in 1951 as the Lyons Electronic Office, or LEO computer. This was pressed into service collating the requirements of Lyons’ nationwide chain of tea-rooms, managing the inventory, and controlling the production and dispatch of baked products to the tea-shops. Today, only the smallest enterprises are run without computers, and the management of data and information using computers is central to the operations of government and public services too. But computing is also essential to scientific research and technology development — and has itself become the object of scientific research and technology development. I have no idea just when the term ‘Information Technology’ or ‘IT’ started to be used as a synonym for computing, but I suspect the reason was to ‘big up’ the image of computing and its practitioners to business bosses and politicians. Personally I do not like the term. Firstly, because there are many other uses for computers apart from in managing information, and calling all computing ‘IT’ ignores that. Secondly, many non-computing technologies have been employed through the centuries in connection with information, for example in the writing and printing of books. Hence my reservations about the BCS’s move to suppress pronuncation of the C-word, while describing itself as the Chartered Institute for IT. On the other hand, I feel very positive about the adoption by the BCS of ‘Enabling the information society’ as a statement of its mission; which I find both humble and ambitious at the same time. Why humble? Because the slogan does not claim that computer people are the only heroes of the information society. There are, after all, other people who know a thing or two about how to deal with information: researchers, teachers, writers and editors, publishers, library and information science people. Consider my craft practice as a writer, information designer, illustrator, photographer, typographer and media producer. I used to practice all these crafts without a computer, but without a doubt the Apple Macintosh, the PostScript language, digital cameras, all that lovely software, and of course the Internet, have been very enabling indeed. The computer and communications industries, now thoroughly converged, are providing the world with the infrastructure and tools which information and media workers like me rely on to create, manage and disseminate information products, and various cultural creations too. And it’s not only about production: in the last two decades, what I prefer to call CCTs — computing and communications technologies — have also become the means by which ordinary people access information, enjoy cultural media creations like films and music, and communicate with each other. Thus CCTs, and the people who know how to create them and make them work, are essential enablers to all these practices. It’s true, ‘information society’ is more of a sloganeering term than a clear definition. There is some reasonably authoritative precedent for it, however. In 2003 in Geneva and 2005 in Tunis, the United Nations held a two-part conference called WSIS, the World Summit for the Information Society. It was managed by UNESCO and the ITU, and I’m afraid the British Government didn’t take it very seriously, but at least I can say that the BCS Specialist Group community did. Certainly on the UNESCO side of the WSIS organisation, the concept of the Information Society carried with it a commitment to promoting wider access to the technical means of accessing and sharing information. In preparatory papers for WSIS, UNESCO also identified the need to promote what they called ‘information literacy’, the skills people need to be able to find the information they need, evaluate its worth and make critical use of it. And information literacy was the topic we focussed on in the January 2003 BCS-DCSG workshop. In explaining the importance of the new mission statement, BCS President Elisabeth Sparrow spoke to the Member Groups Convention of several ways in which the BCS can work towards enabling the information society. For a start, society needs information-oriented computer systems that are fit for purpose, and one of the BCS’s principal aims is to promote professionalism among computing practitioners. The BCS has also committed itself to bridging the gap between education, practice and research. I would expect the member groups to contribute a lot to this bridging process, because they already provide a focus for collaboration between academics and practitioners. The BCS is a charity and has a Royal Charter which commits it to working for the public good. One of the commitments described in the transformation launch document (also entitled Enabling the information society) is to ‘Informing public policy on how IT can contribute to society’ and another is to ‘Ensuring everyone benefits from IT’. To be honest, in recent years the BCS and its member groups have had a difficult relationship; the groups have felt under-appreciated and over-controlled, and there is suspicion that there are some BCS staff who wish the groups would just go away and let the staff get on with running the whole show. But the mood at this week’s Member Groups Convention was much more positive, and with this new expression of the BCS’s role as helping to enable the information society, we have an agenda with which the member groups can engage with enthusiasm, and to which we have a lot to contribute. This I think is particularly true for the Specialist Groups, many of which are engaged with external ‘communities of use’ for computer and communications technologies and information-handling systems (health informatics is a good example, and so is electronic publishing). In a way we act as a natural interface between the BCS and wider communities of information users. One informal project that I have been involved in running is the discussion community KIDMM (on Knowledge, Information, Data and Metadata Management), which started as a collaboration between members of a dozen or so BCS SGs, held a founding workshop in March 2006 and now, three and a half years on, has held three other events and has eighty members of its discussion list. Most are BCS members, but many have joined us from other communities equally committed to enabling the information society.